With 50 states and 52 weeks in a year, we had two weeks of "play" time which we gave to Washington, D.C. last week and, with all our FH Canadian friends, we give Canada this week's 1968 tribute survey. Instead of featuring an Eastern city, we go to Calgary, a city of over one million people today! 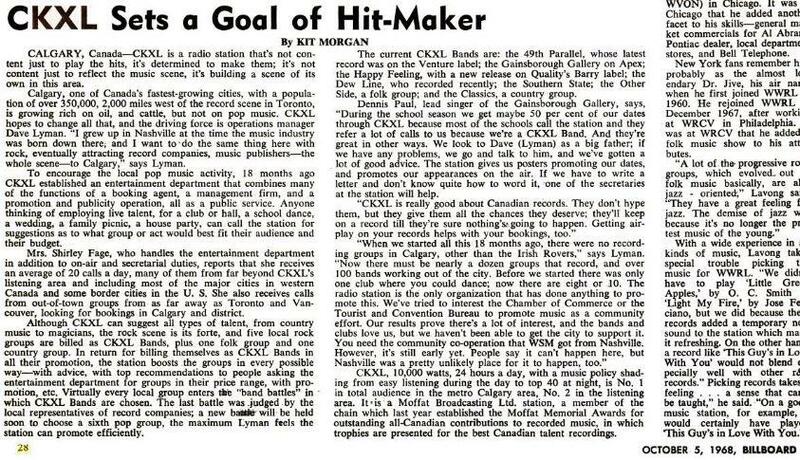 CKXL was more than a station PLAYING the hits ... it was attempting to CREATE the hits! At #1 this week in 1968 were the "CKXL Happy Feeling" with their giant local hit, "Happy Feeling." What was this all about? Earlier in the month, Billboard magazine explained how CKXL was deciding to designate certain local groups as "CKXL bands" that the station would help to promote! These bands were winners of the CKXL Battle of the Bands contests and winners were promoted by the station. Promotion is one thing, but to #1???? They started this band battle thing 18 months earlier when there "were no Calgary bands but the Irish Rovers." As of the article, CKXL claimed 100 bands working in the city and a dozen groups recording. You will find several OTHER Canadian artists on this chart, but I particularly like a song that was top 10 the week previously in the American Everly Brothers song "Milk Train." The Everlies had some tremendous songs in the mid and late 60's that failed in the US charts, but made it in other countries. They were passé in the US but this hit on CKXL was almost like a new "Sugar Shack" song, IMO. I love it. They had a #2 song in the UK in '65 with the incredible "Price of Love," which was almost stolen completely for Shocking Blue's "Mighty Joe" a few years later. Leapy Lee's got a Top Three hit again this week with "Little Arrows" ... I still don't understand why this wasn't a bigger hit nationally based on some of the recent charts we've seen. 11/13/68 – Rolling Stones Guitarist Brian Jones buys Cotchford Farms in Sussex, England. Author A.A. Milne wrote “Winnie The Pooh” here and there were still statues of Pool characters on the grounds at the time of Brian’s purchase. Fred Winston fans (and I happen to be a huge one!) can hear this radio icon this evening when he guests on Fred Lange’s “All Over The Planet” radio program from 6:30 – 8:30 pm (eastern time) on Radio Harbor Country, WRHZ 93.5-FM and WRHC 106.7-FM, broadcast out of Three Oaks, Michigan. Just heard from Bruce Belland. After 64 Years, (Yes, That's Not A Typo!) THE FOUR PREPS are calling it quits. The date of their final appearances will December 5, 2018. Keep up with the great work here on the blog. The Four Preps enjoyed their first real chart success in 1958 with the #2 Hit “26 Miles.” They followed that up with a #3 record, “Big Man,” but never hit The Top Ten again. They were often lumped into the Folk Rock boom of the early ‘60’s but really predated that era by a few years, as did The Kingston Trio, who became sort of the Poster Children of that genre. Rhodes, who may or may not have retired from the county government job he got elected to multiple times, is still chugging along with weekly oldies shows on listener-supported FM stations in his local area in Ohio, and, unless we hear otherwise, is presumably working on his 36-hour marathon (12 noon Christmas Eve Day to midnight Christmas Night) of holiday cheer heard on a mess of stations and IHeart. I wanted to share a Christmas novelty tune I wrote that seems to be catching on! I wrote is a tribute to Joey Dee and the Starlighters and he is thrilled! It is called "Santa Does the Peppermint Twist (Down Candy Cane Lane)" and is about Santa dancing to that classic along with his elves! Just thought you might enjoy sharing it as a Christmas novelty dance tune! Here is what Joey had to say about it! Well we got a new dance and it goes like this! Hi everybody! This is Joey Dee from the Starlighters, the originator and writer of the Peppermint Twist song and dance. I’d like to tell you about a new song and dance that’s coming out. It’s called Santa Does the Peppermint Twist (Down Candy Cane Lane). Now, I’ve heard the music and it's fantastic and man, it revives the Peppermint Twist all over again! The guys that wrote it (Bill Dann and Jack Servello) are from our era and they love the Peppermint Twist as much as I do. So don’t forget, Santa Does the Peppermint Twist (Down Candy Cane Lane). Be there or be square! By the way, you don’t stop twisting because you get old; you get old because you stop twisting! Merry Christmas, Happy Hanukkah, and Happy New Year everyone! Anyway, I would be honored to have you share it with the group and I thank you for all that you do to promote those long forgotten favorites! P.S. If you know of any radio stations who may be interested in airing it, I will gladly send along an MP3! KEEP THE BALL ROLLING, GUYS. I do remember the record by Peter & Gordon with the tune YOU'VE HAD BETTER TIMES. Locally here in OKC, it made it's initial survey appearance for the week of August 1, 1968. It was on the survey for seven weeks, peaking at #20. Hadn't heard it in a very long time and had to get it out to remember what it sounded like. ROCKERS DELIGHT — The sight of Pete Townshend, alone on stage, with an acoustic guitar performing, was as strong an image as I’ve ever seen. A sight to behold. To me, that was and is what rock ‘n roll is all about. Definitely one of the highlights of the year. I’d never seen him play live – and, sing - but he was tremendous; not losing a beat. I see him often at Steve Walter’s The Cutting Room; he lives in NYC and is a terrific gentleman. The performances were especially good this year, opening with a terrific medley of songs by The Jackson 5 from the kids from School of Rock. J. Robert Spencer followed with a great take on “Woodstock” and then “River Deep, Mountain High” from Eric Michael Krop. Max Sangerman and Tommy Burnett (Modern English) followed with English’s classic “I Melt With You.” Constantine Maroulis, just a terrific vocalist and performer, followed with Gun N’ Roses’ “Welcome To The Jungle.” And that was followed by a terrific performance of “Because The Night” from Alice Ripley. Then, Kehr came on and introduced a video from Cerveris, who could not attend due to filming (Netflix’s Mindhunter), and Pete Townshend came on to accept the award. He told a funny story about Cerveris’ audition for Tommy and how dreadful it was. He said that he took Cerveris to every pub and club possible to get him into the role and that at the late, great China Club, he finally succumbed. Townshend then performed “Drowned” (from The Who’s sixth album Quadrophenia; 1973) and “Let My Love Open The Door” and was simply marvelous. 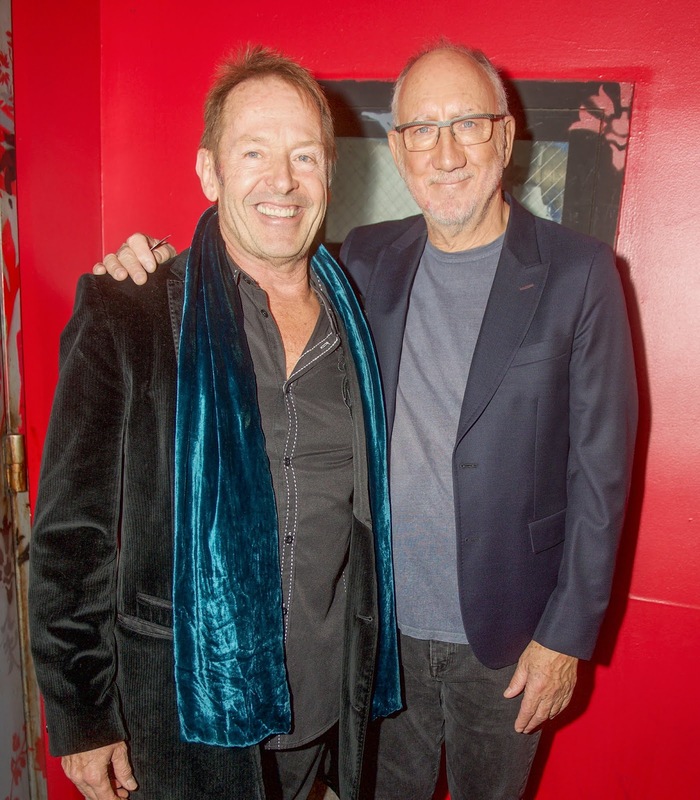 For the record, Townshend was completely approachable and in exquisite form. I was backstage for a time and could not take my eyes off him, sitting on the couch going over the music. A piece of rock-history for sure. 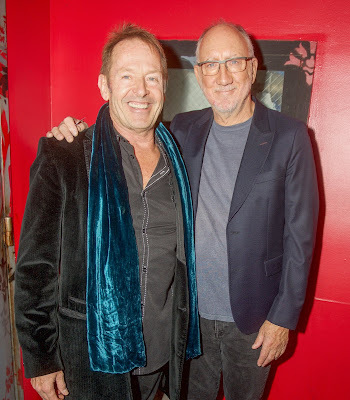 Then the cast of the play The Who’s Tommy (also celebrating their 25th anniversary) came onstage and performed a terrific medley from the show – Townshend stood off stage smiling. I’m moved to say that the material from Tommy (originally released in 1969) sounded as fresh and as relevant as ever! Also seen at the event were Maureen Van Zandt; Dina Regine; Rockers-PR-man David Salidor, who handled the media for the event; May Pang; photographers Bobby Bank and Jeff Smith. The band, assembled by Kehr, was as vibrant as ever. Sensational. Said Kehr:, “It was a historic night for Rockers; terrific in every way.” Absolutely, one of the best ever. 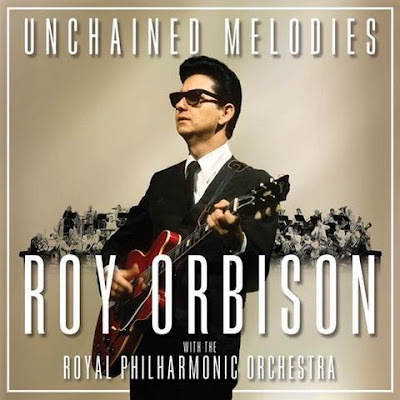 Just a quick reminder that the second collaboration between Roy Orbison and The Royal Philharmonic Orchestra, Unchained Melodies, is officially out today from Roy’s Boys and Legacy Recordings. Here’s a link to a video for “Heartbreak Radio,” one of the album’s 15 tracks. The song originally came out in 1992 on Roy’s King of Hearts album. As you’ll see in the video, this new version includes the participation of all of his surviving sons -- Wesley, Roy Jr. and Alex — their wives, Roy’s grandkids (and RPO). Also of note is the fact that Rick Vito (former Fleetwood Mac) plays slide on this version. He was asked to do the same on the original but he had to beg off since he wasn’t in town at the time Roy asked him — a major regret of his for years — so that circle is now complete. The baby with the tambourine is Bo Orbison (Roy Jr and Åsa's younger son) and the toddler on Alex's lap behind the drums is Roy III, Bo’s older brother. The female voice you hear is that of country star Cam, by the way. Singer/songwriter/ minstrel Gordon Lightfoot turns 80 ... that day. 87.7 / Me-TV-FM will be saluting the music of Ol' Gordo throughout the day. (Head honco Neal Sabin is a big fan.) Hmm ... I wonder if I could get them to play Burton Cummings' incredible tribute to this Canadian troubadour??? And we should also pay a quick tribute to Roy Clark, who passed away yesterday at the age of 85. Clark had a lengthy career in country music ... but we all got to know him when he teamed up with another country legend, Buck Owens, and came into our living rooms every week on the hit television series "Hee Haw." Limited postings the next ten days ... so please check back when you can. And, speaking of "Bohemian Rhapsody," 24 minutes were cut from the film before it could be shown in Malaysia, which has a VERY strict ban on anything to do with gay activity. Meanwhile Queen, the movie and the title track are popping up everywhere! Even this past week’s episode of “The Goldbergs” was titled “Bohemian Rap City” as Barry Goldberg (aka Big Tasty) created what he thought in HIS mind was a rap improvement to the Queen classic. With the box office success of the Queen biopic "Bohemian Rhapsody," a May, 2014, Queen Productions authorized documentary on the band, "Queen: Days Of Our Lives" is now broadcasting globally and being viewed by millions. Director Matthew O'Casey filmed author and music historian Harvey Kubernik for the original BBC Television airing, "Queen at 40," which is now released as a DVD via Universal Music Enterprises. Kubernik appears in the program four times alongside group members Brian May, Roger Taylor, record producer Roy Thomas Baker and David Bowie. In the late seventies Kubernik interviewed Queen's Freddie Mercury twice. Once in Hollywood and then in London. This item is on the internet, culled from a display from one of my book publishers. NEVER underestimate the power of television, especially when a music documentary airs globally about one of the most iconic bands of all-time. Here I am going to two markets on a sunny afternoon in Southern California. Two different people behind the counter ask if I was “the guy they saw last night on a Queen documentary." I had no idea it has been running, obviously coinciding with the theatrical release of "Bohemian Rhapsody." I did this appearance in 2012 for BBC-TV, and now it's out on a DVD from Universal Music and connecting with a whole new and different demographic. Besides answering some deep Queen queries, I was politely asked about Herb Alpert, The Go-Go's, the music of Laurel Canyon and the Eagles. It was a regional flash. One dude went home on his lunch break and brought back a slew of my books to sign. He even added a free side of guacamole on my sandwich! I then returned to the market later that evening with a friend of mine, entertainment publicist Hal Lifson ... you might know his book about year 1966 music book. I was in the process of writing a story on The Doors and the 50th anniversary of their "Waiting For The Sun" album. Taking a break, I kid you not, as we were existing the store, Robby Krieger of The Doors walks right into us. I've known him for many years … saw the band in 1968. I initially looked at this magical encounter as a signal. But the telephone rang and it was Andrew Loog Oldham who, once again, indicated to me that "there are no accidents." I am blessed. We all are. By the way, www.cavehollywood.com now has the Doors story spotlighted. I look forward to you devouring the pages and absorbing the text and visuals. Might take you days to discover and recover! This book took 50 years to live and I know you and many others will feel it. You will delight in the dozens of revealing new facts, unheard voices and familiar musicians. In a 1977 interview Freddie Mercury of Queen reinforced to me it's about taking risks. That's been my job and expedition goal for many decades. 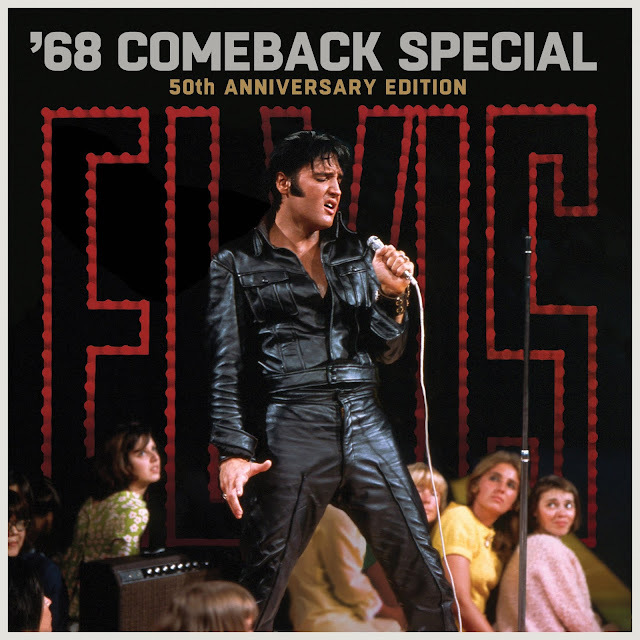 On Tuesday you and your viewers / readers might really enjoy the 9,000 word essay I've done on the '68 Elvis Comeback Special that will be displayed on www.cavehollywood.com. Feel free to let the universe know about this expanded format product re-release, set for November 30th. 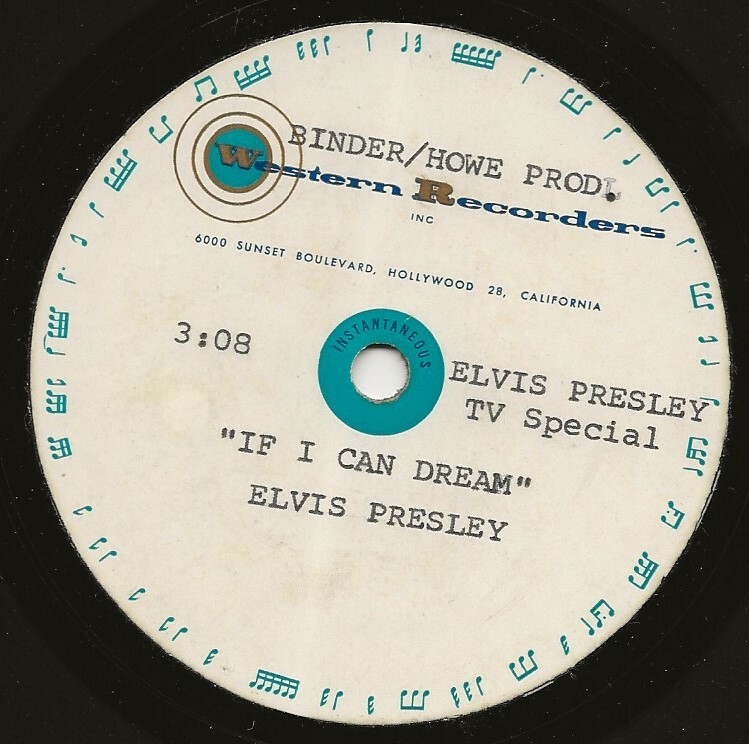 And how 'bout this acetate label copy of "If I Can Dream" courtesy of Bob Say! With all the recent discussion about Chad & Jeremy and Peter & Gordon, a couple of thoughts come to mind that might be worth sharing. Peter & Gordon had a release in 1968, "You've Had Better Times," that we played a lot at AFKN in Korea. It was a bit edgy, but had a good sound, though quite outside their normal presentation. Don't know how it did stateside. Chad & Jeremy live on today in the Zits comic strip (A top two favorite of mine). The teen character is Jeremy, and his seldom-seen brother is Chad. Apparently one of the cartoonists is a 60s buff like us. Chad Duncan is Jeremy's older brother by four years. He attends college (the college has been identified in the strip as the University of Notre Dame) and is an overachiever and the object of much jealousy by Jeremy. In his first few appearances, Chad was said to be the perfect child, having his face slightly obscured, and having a more muscular build. He was later re-drawn as looking like an older version of Jeremy with a goatee. Chad is an occasional character and rarely appears, typically showing up during the holiday seasons and leaving abruptly. In one strip, he told Jeremy he had been there for two weeks already. After Jeremy said he needed to pay more attention, Chad replied, "That's what I keep telling your sister." Chad is a business major, "with a minor in uncommunication", according to Walt, as he almost never calls home. First, I appreciate the suggestion you made to Mike Stineman as I have had the same problem of these audio clips not opening on my computer. Thanks for mentioning the refreshing of the page. Last weekend, I was not able to play all of the audio clips you had since most of them didn't open. One final thing, if I may. I was curious about something. On October 30th, I sent you an email asking or wondering if recent new reader Carl Mann was the same Carl Mann that worked here in OKC in the 60's - early 70's. I also sent a copy of station KOOK’s survey for the first week in 1967, I believe. Again, just curious if he was the same Carl Mann who worked here in OKC years ago. Don't know if you had heard back from him or not. I believe it is the same Carl Mann but I am not sure. Ran across this special of music and a band that will never be again. Like, Buddy Holly, you just don't know at the time, the degree of greatness you are witnessing. This interview with Randy Bachman is as fine of an interview as I have ever heard. Another award for Cousin Brucie. 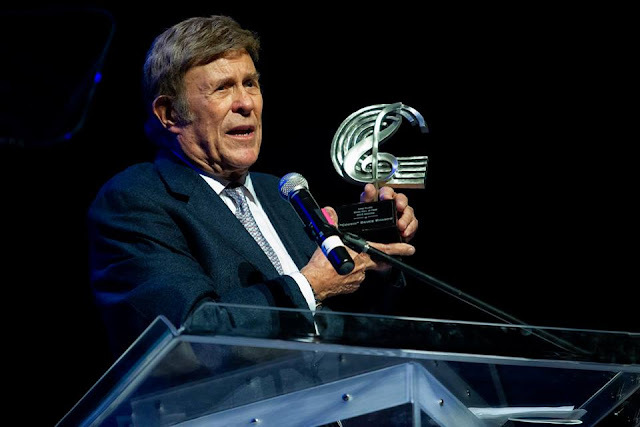 Bruce "Cousin Brucie" Morrow receives his award, November 8, 2018, at The Long Island Music Hall of Fame 7th Awards Ceremony and Induction Gala. Photo: Arnie Goodman Photography — at The Space at Westbury Theater. I know we’ve had this debate before in Forgotten Hits … but I just don’t get him!!! I tried to listen again the other day on Sirius XM, the ‘60’s Channel, and he couldn’t have sounded more disengaged with what was going on. (Not to mention the fact that at least HALF of the music he played wasn’t from the ‘60’s at all!) He completely lost his way a couple of times and it got to the point where I just had to turn him off … it was literally unlistenable! Thank you for your mention of the station in conjunction with the Christmas special. We start at 8:00 am on Christmas Eve and send it through four consecutive cycles all the way up to Midnight on Christmas night. We’re thinking of going to the Ides Xmas show this year … worth going to see? 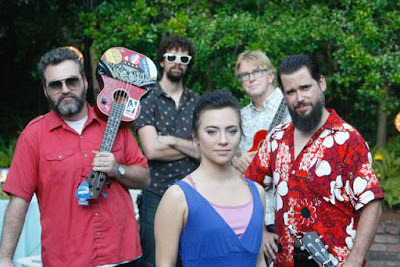 We’d like to tell you about The Memphis Ukulele Band’s forthcoming 7-track EP, Holidays Ain’t The Same. Let’s be honest: nobody wants to think about, much less hear, Christmas music before Halloween. OK, now that Halloween -- and the midterm elections -- have come and gone, we figured it would be worth the effort to remind you about it. There are only 41, going on 40, days left until you know what. 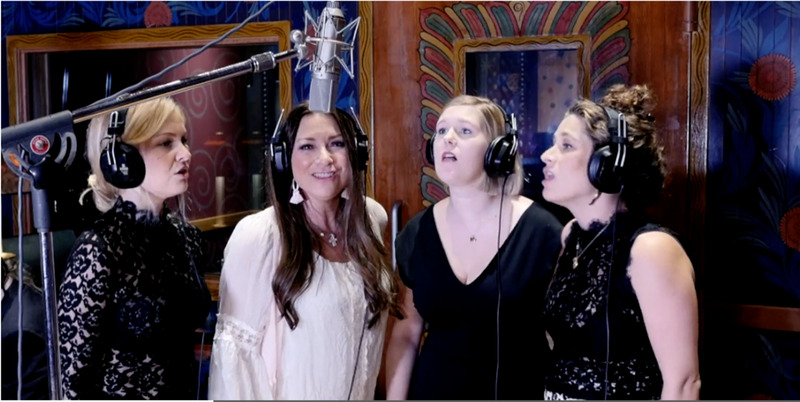 This very unique holiday EP was recorded earlier this fall, “live on the floor,” at Sam Phillips Recording in Memphis with Halley Phillips, granddaughter of the studio’s founder and namesake, producing. Staying within the musical parameters of the city from which their name is derived, the group also tackles “Blue Christmas,” the holiday song most associated with Elvis Presley. Other holiday standards in the set include “Merry Christmas Baby,” dating from 1947 when it became a huge R&B hit for Johnny Moore’s Three Blazers with the legendary Charles Brown singing lead. There’s also the Hawaiian holiday standard, “Mele Kalikimaka” that was first recorded by Bing Crosby in 1949 and which the MUB crew sourced from Liz and Jim Beloff’s The Daily Ukulele songbook. Another non-standard standard in the set is Paul Williams’ “When The River Meets The Sea.” The EP’s new songs include “Merry Christmas Broken Hearts,” written by the producer and Jerry Phillips, her dad. Another standard-in-the-making is the title song, written by Mark Edgar Stuart, who sings and handles bass uke for the group. On “Holidays Ain’t The Same (Without You),” he’s heard playing “guitarlele,” a hybrid that’s a perfect counterpoint for his poignant Americana ballad. The band’s current lineup includes founder Jon Hornyak, a veteran of the Mid-South music scene who was primarily a keyboard player. That all changed after a visit to Kauai and Larry’s Music Center in Kapaa. He came back to Memphis not only with Kamoa custom ukuleles but also a passion to spread the good uke word. He was soon joined by the aforementioned Mark Edgar Stuart, a singer-songwriter of renown whose “day job” finds him at Sun Studio – it just doesn’t get any more Memphis than that. Jason Freeman, a roots rocker, has been providing music for such films as Hustle & Flow, Black Snake Moan and MTV’s Savage Country. He not only plays tenor and banjo ukulele but also harmonica and kazoo. Logan Hanna handles guitarlele and baritone ukulele for MUB and, in his “other” life, is an in-demand session player and tours with the “Elvis Live In Concert” touring band. Lastly, there’s MUB’s newest member Kyndle McMahan, a singer’s singer whether she’s fronting a horn-driven R&B band or in a gentle folk or Americana mode. With MUB, her acoustic intimacy of performing at low volume allows her brilliant voice full expression and dynamic control. Holidays Ain’t The Same is just that: not the same but something very different, very innovative, very fresh, very “uke” and very Memphis. It’s a unique blend of “uked-out” seasonal music to be served at your next Christmas luau or holiday barbeque. One of my favorite "lost" Christmas tunes was played often here locally upon the original release time (late 1975) but I never, ever hear it played anymore, not even on oldies stations: "The Christmas Song" by Gilbert O' Sullivan. It's not the same song as the Nat King Cole holiday chestnut. The melody and hook grabs you (well, me) I can even hum it in my head decades later. I honestly don’t think I’m familiar with that one – so I had to visit iTunes and check it out. Gary has a nice mix of Christmas songs for sure. I'm sure these things have gone on radio forever, but in the past were limited to the 45s and LPs stations had available to them (60's, 70's, 80's etc). My main memories were of Dusty Rhodes on WLW Cincinnati doing his long shows on Sunday nights at Christmas. We would attempt to drive my mom around looking at the lights of the city while Dusty set the mood. I did not see MY fave Christmas songs in his list, but they are more obscure, I guess. The Three Wise Men's "Thanks For Christmas" was a 1980's song that is actually XTC. The Gene Cotton one may have too much political commentary for many these days, but it never seemed to matter before, as it is nearly 40 years old now. It is extra cool because it was NOT meant for sale when sent to stations and it said play freely but not for sale on the 45. How cool was that? ANYWAY, good show, Gary and hope these two tracks make the FH list. We never made it to The Arcada Tuesday Night to see Gladys Knight (another worked too late night) … so if any of our reader were there at the show, we would LOVE to hear from you so we can share your review online. And I just heard that Boz Scaggs will be one of the artists performing as part of the Elk Grove Village Tuesday Night Free Concert In The Park Series next year. If you weren’t a Michael Buble fan before, maybe this clip will win you over. Now THAT'S What I Call Christmas!! !